The deets: Everly dress (old); Boutique 9 heels; Lancome "Midnight Rose" lipstick; Ray-Ban sunnies; GiGi NY clutch; Betsy Johnson chain; earrings c/o Too Much Soul; Cocktail ring c/o D'Milikah. Our good friend passed the bar this week and celebratory drinks were in order. This is chevron number is what I decided on. Side note - I WALKED to said celebration in these 5 inch heels from my place (which is about a mile and a half) because the metro was delayed. If that is not a testament to my commitment to our friendship, I don't know what is. Don't forget to enter to win a ring like mine here! i have this same dress in teal and blue!!! i love everly! and i'm sorry, but i don't know of anyone i'd walk a mile and half in heels for. like, no one. that's what cabs are for my dear! but good for you--i just hope your heels aren't ruined! wow you walked a mile and a half in 5 inch heels? i couldn't walke that in flats! haha :P cute dress! What a beautiful dress! I love the dress! 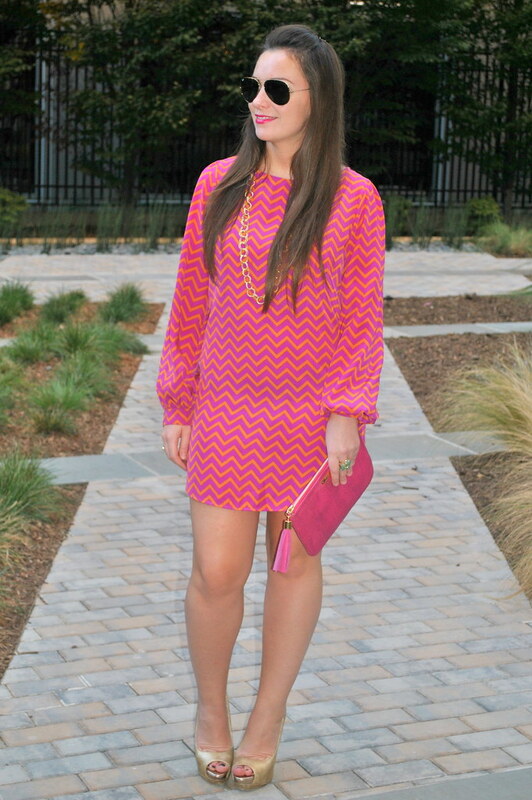 You look beautiful, love this chevron dress! We should nickname you dive fashionista blogger! Loving this outfit, and bright colours, perfect for rocking out! HA-ha wow good for you, thats a long walk in those heals. Love this dress its so much fun! you look great girl ! i love that dress. those colors are great on you. i so would have slipped a pair of flats in my bag and walked in them.... you are a strong lady to strut around in those pumps! You look so cute! I love this outfit, the colors of your dress are so fun! Love the colors and patterns of the dress!! Kudos for walking in those heels. I love these two colors together, especially in a chevron print. You look gorgeous! That's why I love you!!! I love dressing up for celebrations of any kind - and I love this whole look! Go you, walking a mile in 5 inch heels! Color me muy impressed! Pretty in pink! Love the dress! that is an impressive feat! Hope your feet didn't hurt to much by the end of it. 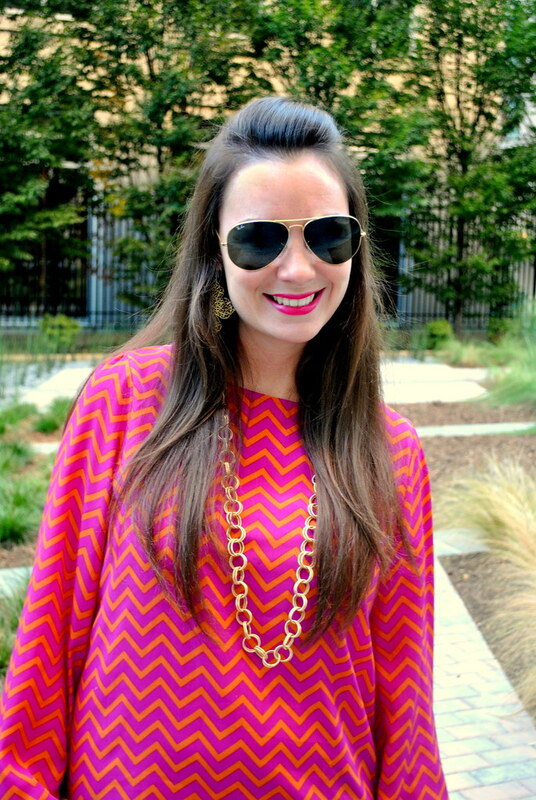 Love your bright chevron dress. it is so cute. Loooooooove the dress!! So many fabulous things about it - the color the shape, the sleeves....love! Love your dress, you look stunning! The print is so bold and I love the mix of pink and orange! what a beautiful dress!! I love it!